La Jolla, CA, USA — October, 1 2014 — MadCap Software, Inc., the leader in multi-channel content authoring and a showcase company for Microsoft (NASDAQ: MSFT) Visual Studio and Microsoft XPS, today announced that it has published a new case study on The Big Salad. 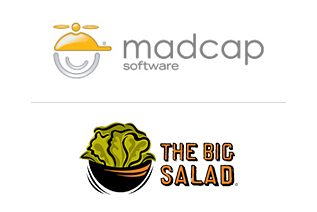 A fast casual food franchise chain specializing in healthy food products, The Big Salad relies on MadCap Flare for single-source, multi-channel publishing of a modern HTML5 intranet and PDFs to ensure consistency across its company-owned and franchise restaurants. The full case study can be viewed at: https://www.madcapsoftware.com/casestudy/TheBigSalad.aspx. Since 2008, The Big Salad has been dedicated to providing fresh and healthy salad, sandwich, soup and wrap options in the greater Michigan area. The company has built its brand by fostering consistently superior products and services across its growing number of corporate and franchise locations. Looking to expand the reach of its quality dining experience, The Big Salad plans to have 220 locations in production by 2020. To support promote consistency across all restaurant locations, the company has developed its own Web-based best practices system, called the “The Big Salad Cookbook,” which is used by all staff members—from the CEO to every franchise employee. The company now relies on MadCap Flare to publish The Big Salad Cookbook in two formats: an HTML5-based reference intranet and a collection of PDF guides and manuals. Topic-based authoring and conditional tags in Flare make it easy to generate content tailored to different groups of corporate and franchise users. Single-source publishing in Flare enables The Big Salad to publish content on the intranet and in PDFs from the same Flare project. Microsoft® Word integration with Flare allows the documentation team to easily import new content from subject matter experts. HTML5 output provides users with a visually attractive, state-of-the-art intranet resource. Hyperlinking YouTube™ videos to Flare-based content provides a richer, visual training experience. The Big Salad is an emerging fast casual food franchise chain specializing in healthy food products. The company’s consumers are concerned about what they eat, where it’s from, and how it’s prepared. Since 2008, The Big Salad has been a corporate and franchise-location chain. Headquartered in Grosse Point, Michigan. The Big Salad is actively engaged with prospective franchise candidates across the nation. To learn more, visit http://www.thebigsalad.net. MadCap Software, the MadCap Software logo and MadCap Flare are trademarks or registered trademarks of MadCap Software, Inc., in the United States and/or other countries.